Thanks to a flexible and forward thinking local building control office who have given us approval to replace their SAP calculations for our PHPP file as they recognise the PHPP file far in exceeds current building regulations - a truly future proof design. Crucially, the Passive House method will offer the inhabitants of the building a constant comfortable internal temperature and a much superior air quality for its inhabitants. This is coupled with the peace of mind that rising fuel costs will have little impact on their pockets. Assuming energy costs will rise every year, initial calculations would suggest that there will be a "pay-back" on the Passive house construction method in year 10, "making money" thereafter! 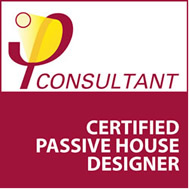 Proud to be able to wear the PassivHaus logo, GP Developments were accredited by the PassivHaus Institute, Dramstadt, Germany in May 2013. To exhibit this logo is a reflection of our commitment to the exceptionally high standards required to execute a PassivHaus project. From foundation design to roof construction, GP Developments ensure the very highest standards at every stage. This commitment to quality and excellence is reflected in the National House Building Confederation accreditation awarded in 2008.